Have you ever been accused of wearing your heart on your sleeve? 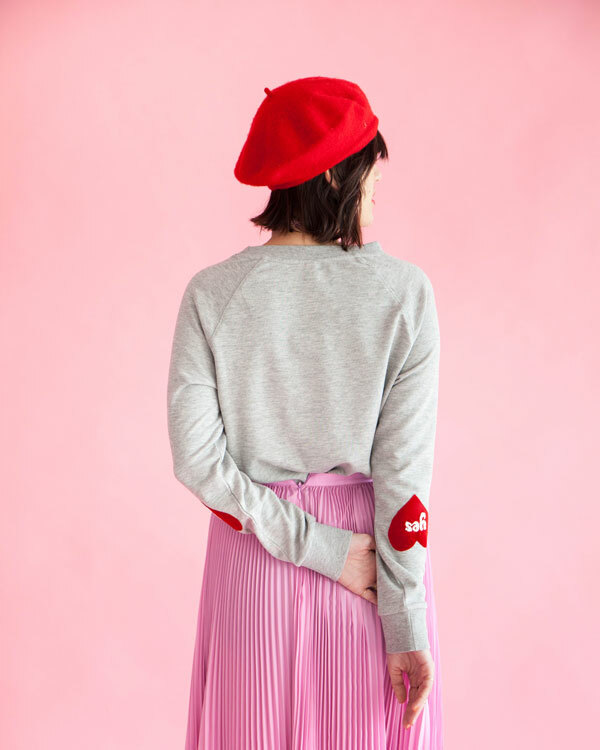 We’re taking the saying literal by adding heart patches to a simple sweatshirt! Back in grade school, I used to pass notes to my crush saying ridiculous things like, “Do you like me? Check yes or no.” Maybe I was just a big loser, (and maybe I still am), but I have all kinds of nostalgia for this kind of adolescent love, hence the “yes” and “no” on the sleeves. 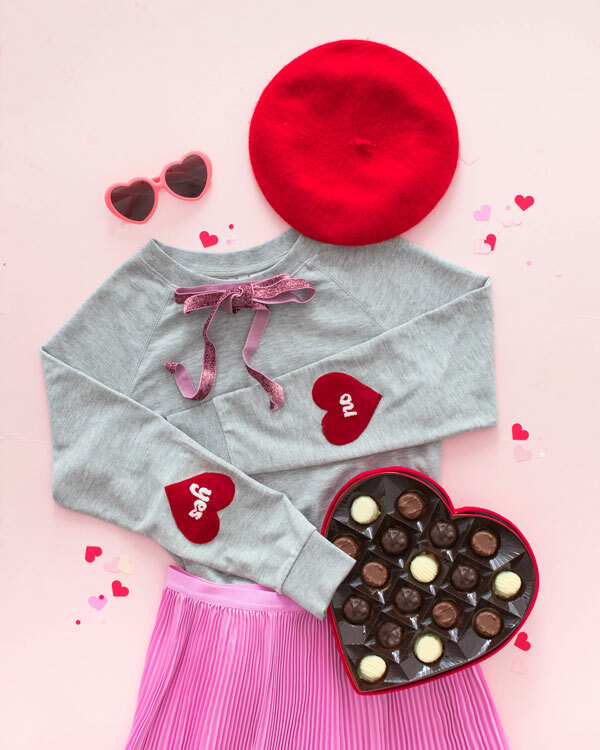 Make it for yourself, or for your Valentine! Step 1: Print out your image with text onto a sheet of tracing paper, then cut out the design with scissors. Step 2: Secure fabric into the embroidery hoop. Center the tracing paper design onto the fabric then tape the edges of the design to secure. Step 3: Use needle and embroidery thread to fill in the text design using a satin stitch. Once the design is filled, remove the tracing paper to reveal your embroidery. Step 4: Remove the fabric from the embroidery hoop. Step 5: Stick the back of the patch to one side of the fusible webbing. Then, cut out the heart outline with scissors. Step 6: Put on the sweatshirt and figure out where you want to place your patches, then mark the placement. Step 7: Iron on the patch using the directions from the fusible webbing. You’re all done! Where did you get the plain gray sweatshirt? I have been looking for one just like that! Most of the manufacturers of fusible web applied to clothing, “recommend machine stitching around the appliqué.” As the elbow gets a lot of movement and stress, it would be a good idea to follow the manufacturer’s recommendation. This DIY is so adorable! I once saw I sweater like this and never forgot it. Excited to try making my own!